I have been really trying to say on track and work on my list of things to do one by one. I'm making some progress. 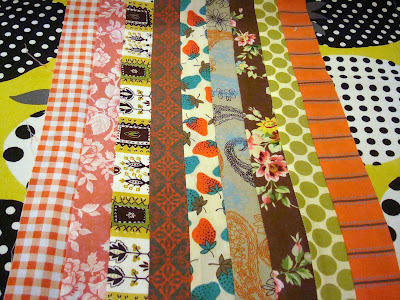 I joined Jane's Rainbow Block challenge and because orange is one of my colors I'm enjoying I chose to make my blocks with luscious orange. 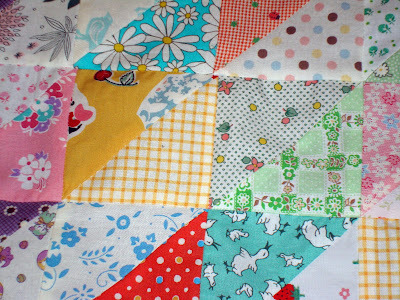 I don't have a lot of this fabric but I was able to pull from my stash to make my blocks for this exchange. I picked this mini bow tie block shown above for making my 9 blocks. And they are done! 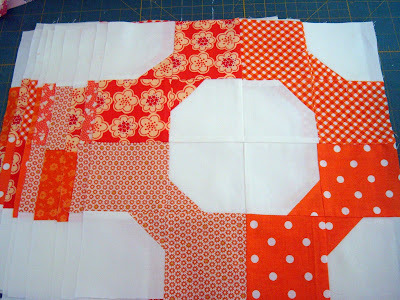 It was a fun block to make and I really found enjoyment using orange. Not only are they done but mailed to Jane! I rolled them all up and shipped them this morning. I'm in group 1 so you other gals ---->get busy! 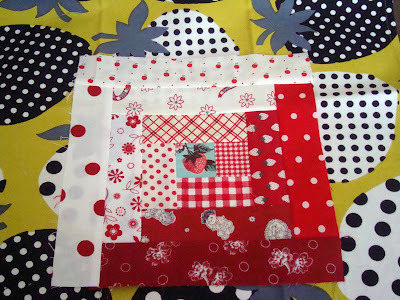 I also offered to make a block for Sandi's "Emma's Hope" quilt. She told me red white and blue were the colors and she let me make the block in my cottage block pattern. I even used some paper doll fabric Sandi sent to me for the little boy in the window on the right. 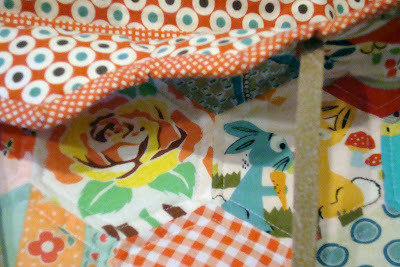 I used some of the fabric Terri gave me for the teacup in the other window and plaid for the roof. I've been using those fabrics here and there Terri. They have been perfect for some projects. Thanks to both of you. My local quilt group, in my little town, is celebrating 20 years of meeting together. Many of us in the group didn't belong back 20 years ago but we have been welcomed with open arms as additions have been made. I so enjoy our group. The learning and exchange of ideas with wonderfully talented women is surpassed by none. To commemorate the 20 years we are making a sampler quilt. Each month 2 blocks are presented by several of us. We can choose our own color palette. Mine is heavy in red and turquoise but with some other colors too for contrast. I wanted to show up to our March meeting tonight with my blocks caught up to show-n-tell. And I made it. The block above is a log cabin. My favorite part is the strawberry, of course. Janice's double block represents the little red church were our group has always met. 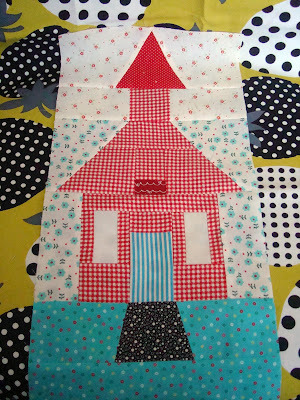 I had fun using my whimsical colors and fabrics to make my red church. The "deputy" Paula (thats a long story) likes to make teeny tiny blocks and she's wonderful at them. Me not so much. And trying and failing at Dear Jane has made me shy away from anything too much under 2". I know myself and I know my limits. So when another member of our group made her own Paula block - signifying mountains - I thought I could stray from the suggested block and make my own mountains block. See above. And see Paula's pattern next to it. It would have been painful for me. But I enjoy seeing others precise and small blocks. At this stage I just don't have it in me. I may at some point! Until the time I get better with itsy bitsy, I will just do my own thing. And those of you that know me, know I do that anyway. Laurel gave us the Sheriff block to make above. It was really fun. We get 2 new blocks tonight at the monthly meeting and my fabric for this quilt is already on my cutting table so I might as well get cracking on them right away. 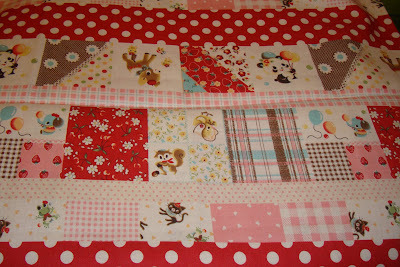 Yeah I know I should have fussy cut the little items in the 9 patch at an angle, oh well. 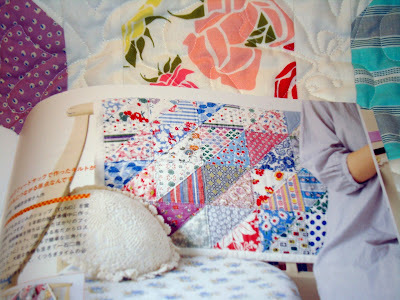 It is such a treat for me when I get a picture showing one of my quilt designs. This Easter Egg above was made by Millie. Go over to her blog for better shots. She made it so springy cute. Thanks Millie. I like unique jewelry, especially the kind found on Etsy - and as my collection slowly grows, I have found the problem that I'm sure most women inevitably have: "How do you store your jewelry in a manner that isn't cluttery and that won't leave you with a tangled mess?" I read about this idea in a magazine and decided that it was perfect for me. 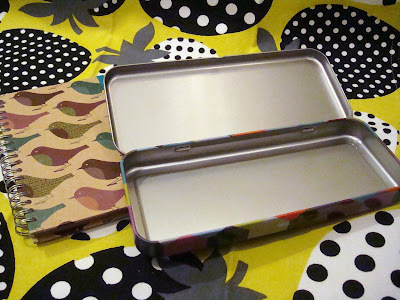 Essentially, you just attach drawer-pulls to a board (I got mine on sale from Anthropologie) and hang it on your wall in your room like you would a picture or a mirror. That way you can use your necklaces to decorate your room when you aren't wearing them. I really like the way it turned out and I don't think I'll have the problem of things getting pushed to the back of the drawer and getting forgotton. I originally bought this blue Brown Sheep Bulky Wool/Mohair blend Lamb's Pride Bulky yarn for a project for my sister, Natalie. However, when it came, it was a little more itchy than I know Natalie likes yarns to be. She likes yarns that are so soft that they begged to be put against your cheek. Again this was very warm, but slightly too itchy for her taste. So, not wanting this yarn to be put to waste, I went through my list of projects in my queue to find one that might fit this yarn. 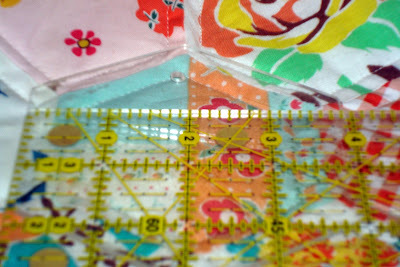 In the process, I came across the perfect fit with the pattern, Juliet from Zephyr. I put this on my knitting queue the previous year, and just had it just kept getting put at the back of my list as more "important" projects took prescedence. A week ago my friend Laura brought me this magazine as a little treat. It has several cute projects in it but one caught my eye first. I was not drawn to the fabric from the bag in the picture. But I could see the little bag was a good idea. When I turned the page I saw this strip-pieced version was more my type. But you know me. 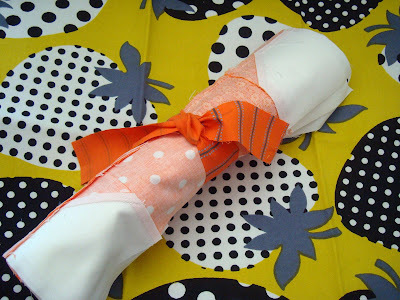 I rarely like to use one fabric line for a project and I often think "the more the merrier". I set out cutting 1 1/2" strips. I wanted a mix of fabrics to make a modern vintage touch so I borrowed some fabric from my daughter Natalie to mix with my fabric. 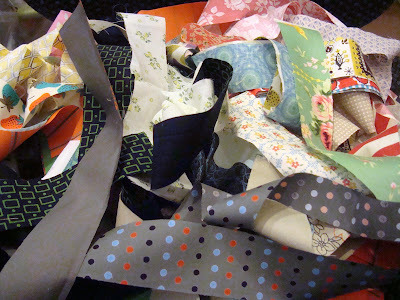 And then this pile of many different fabrics above turned into . . . So I blended these strips above. Eileen do you recognize some of the vintage fabric? You should! Months ago Eileen and I had a fabric swap. I hoarded them for a while but I'm getting brave. And then I made more. And still more. 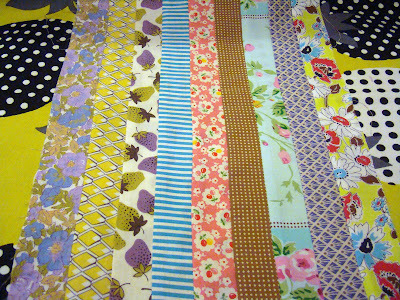 I have more strips cut out not joined yet. 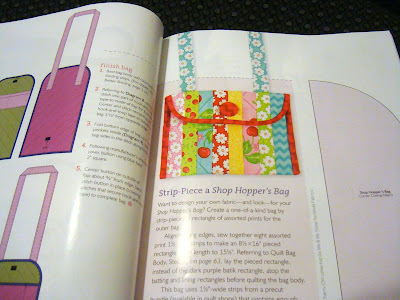 I'm not sure I want to make more than 1 shop hopper bag but you never know. I have been trying to think of other fun things I can make with my new "fabric". My weekend list is overwhelming. So I better get started right now! When my kids were little we differentiated between Easter and Bunny Day. 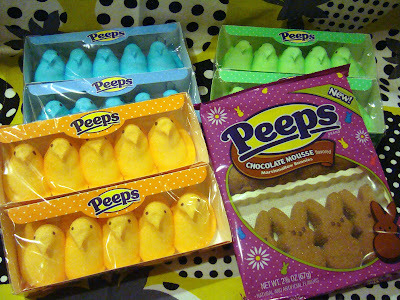 Easter was Sunday and a religious holiday. Bunny Day was the day before Easter on Saturday. That was the day we hid eggs and ate candy. I have heard it is a trend to celebrate nothing around Easter. Could that really be true? I hope not. 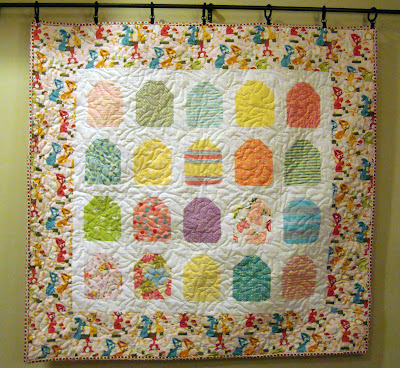 I got my Easter Egg quilt back and promptly bound and hung it up in my sewing room. I'm happy with it. I love the colors and it makes me smile to look at it. Eeep, crooked picture. 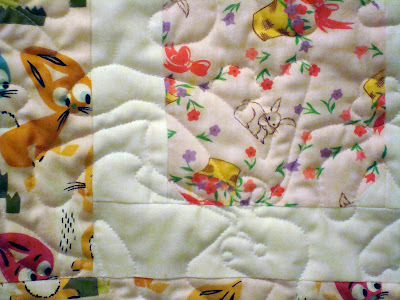 But if you look closely you will see bunnies quilted into the fabric. This bunny is upside down. 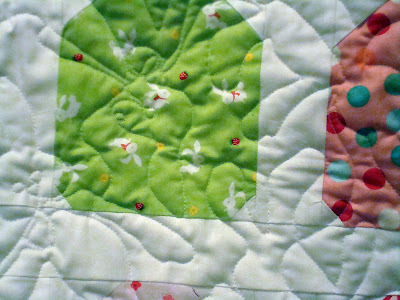 The quilting created a really sweet pattern with the bunnies facing every direction. 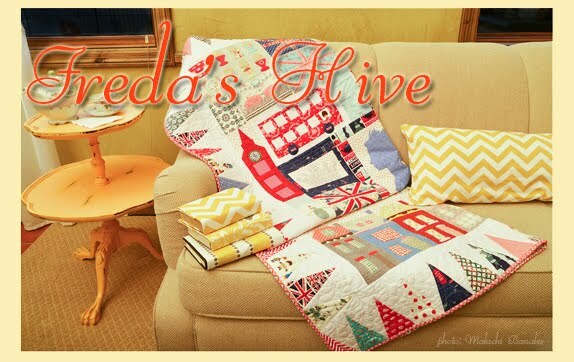 It was quilted by Wendy at Eagle Mountain Quilting. 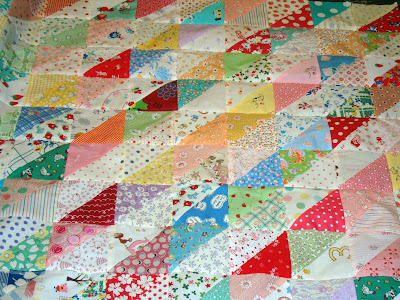 "All Dressed Up Quilt" alert - For those of you with my pattern I told you about Sherri making pinwheels with the extra fabric from the snowball blocks in the quilt. Well Susan has gone one step up. You've got to go see how clever she is with making the pinwheels and snowball blocks in one step. I was going to swipe some pictures from her to show but she tells it best. It is a neat trick and I will be doing this next time whenever I make a snowball block. 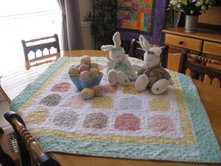 Thanks to Susan and Sherri for making the pattern their own by adding their own expertise. Isn't that most of the fun. A few months ago, Purl featured a pattern for cashmere fingerless gloves. I liked the style and simplicity of the pattern and decided that they would be nice to add to my wardrobe. As nice and luxurious as the idea of owing a pair of cashmere gloves is, I'm not the biggest fan of the fiber. It is very tempermental, sheds easily, and must be washed with extreme care. I use my hands a lot so when I made my own pair I used wool put out by Louet called Gems. I especially like this yarn, because after you wash it -- it blooms a little, and gets much softer. The end-result is a near-cashmere fingerless glove. After completing a pair, I had 2 siblings request a pair for themselves. So - I ended up making a pair for my sister, Jamie, and another pair for Mason, which I gave him on his birthday. In my excitement to open my swap package from Lorraine I did not fully examine everything. Inside one of the feed sacks was this hidden treasure. Doh! I got all my prizes out to show my daughter this weekend and she reached into one of the feed sacks and pulled this out! Then I remembered seeing a tiny bit of it on Lorraine's blog. I had missed the main gift. 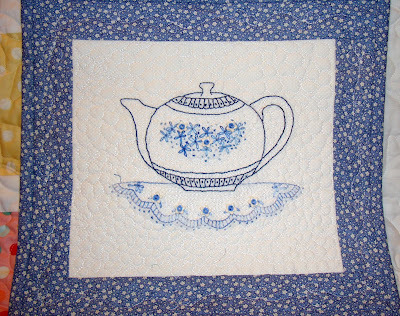 I hurried and emailed Lorraine and then sat and enjoyed this beautiful stitched teapot. Her work is fabulous. I don't really embroider much (or very well) so I truly appreciate careful stitching like this. It is so beautiful. I put it in my entry way to enjoy as I come and go. Thanks again Lorraine. Your machine quilting is so even and nice, too. 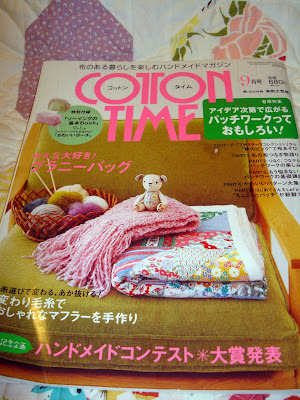 A few months ago I saw this Japanese patchwork magazine on a blog. Hmm where was that? Can't remember. 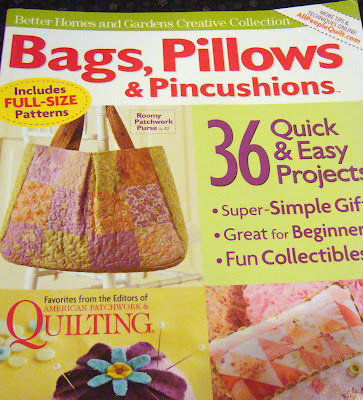 I loved the quilt on the cover and went about looking for a copy for myself. I think I got it on ebay. 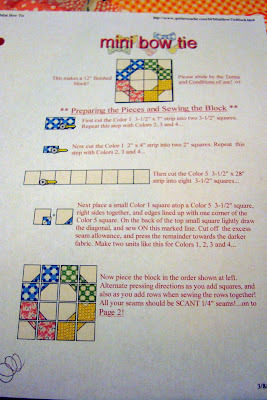 Of course I can only read the picture directions but it is a pretty simple idea and simple quilt. 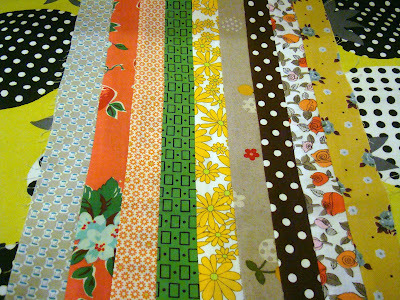 I have so many bits of fabric like the ones in the picture and I think that was what drew me to want to make this quilt. 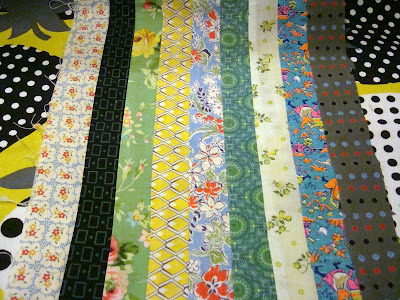 I've been collecting squares from larger pieces as I cut fabric. And so this weekend I buried my list of things to do and started something. Just for fun. Just for me. Perfect points are not my strength but the eye is forgiving when the points are laid out this way and I think it is turning out ok. I have 14 rows sewn together so far. 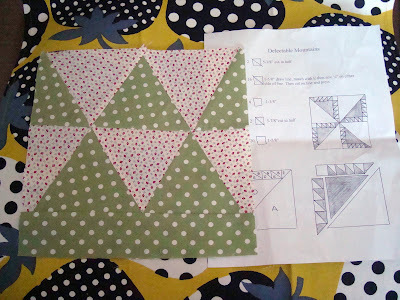 Each block has light and dark value fabric triangles. I cut the triangles from a 4" square and then used each triangle twice. Every row has 12 blocks. I really love scrappy and this surely fits the bill. I haven't thought about borders yet. 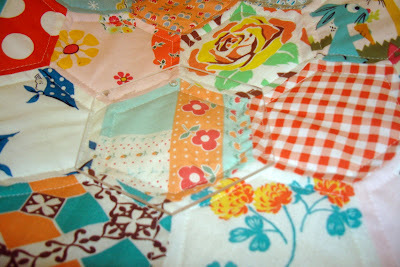 There is a lot going on in the quilt so far so I don't want to overwhelm it with busy borders. Maybe a solid color would be good. 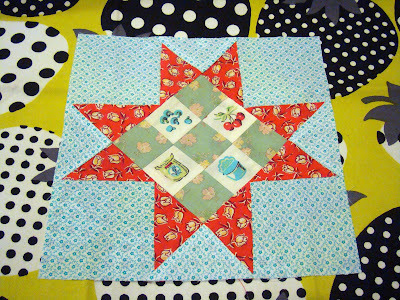 It was very relaxing to cut out the triangles and stitch them together and then make rows. Joining the rows one by one was exciting to see it all come together. I promise myself I will get back to my list one of these days soon. But for right now I'm having too much fun. First off some answers to questions about my hexagon bag I showed yesterday. It is hard to take pictures of clear templates but here are the sizes - 6", 5" and 4". I like to use Inklingo for small hexagons. But for the big hexagons templates work fine. I hope you can see it better but I placed the template I used for my hexagon bag directly over one of the hexagons above. I did machine stitch the hexagons together stopping 1/4" from the edge so it was easier to sew them altogether. 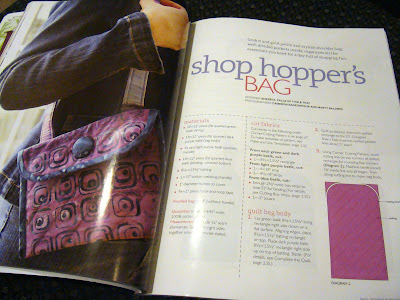 This is kind of a blurred picture but you can see I used the 4" hexagon template to make the bag. 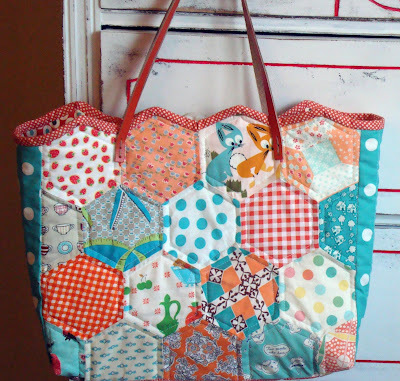 I have another bag cut out ready to sew with hexagons from a larger template. I hope to get a chance to work on that this weekend. Now to fabric. 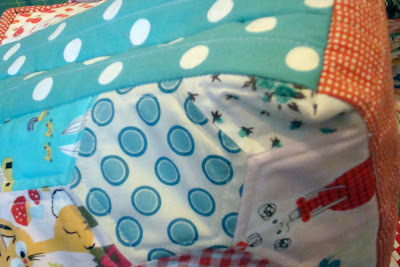 I've been pulling fabric from my shelves to cut into layer cakes so I thought I'd show you some of those fabrics today. 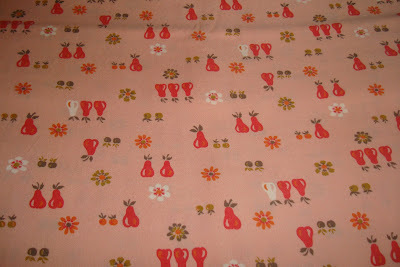 This vintage pink pear fabric is one I happened on for a great price and it is big - 4 yards. It has an ultra soft feel to it. 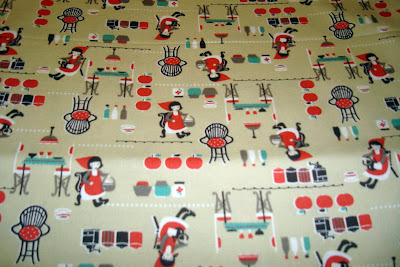 Kitchen fabric is always my favorite and this one has a kitchen and house theme. 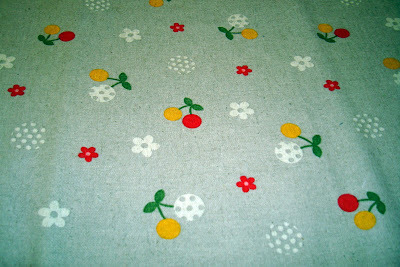 This linen cotton blend has fruit AND dots. It also has a nice soft feel for a linen blend. 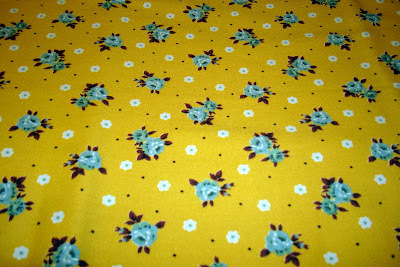 I really like this thicker cotton in pretty blue and yellow. Wouldn't it make such a cute teapot? 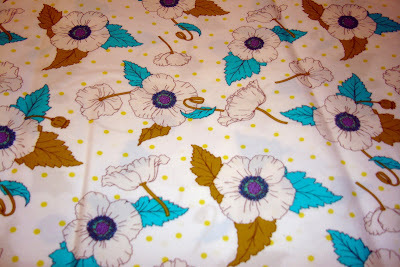 I have this vintage flower fabric in a smallish piece. I love the colors in this floral. This deep color has cute tea pots and tea cups all over it in a small scale. I think this is called "Matilda's Kitchen". It is really sweet. 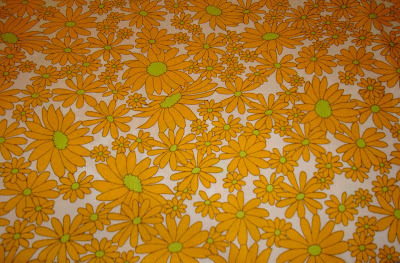 I've never used this piece yet in deep orange/yellow daises. 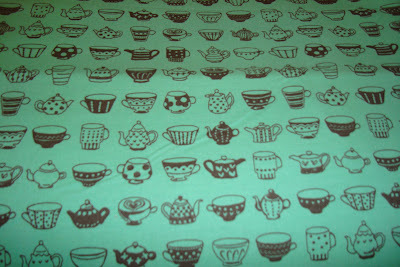 I think it would also make a cute appliqued teapot. This is kind of a strange fabric. 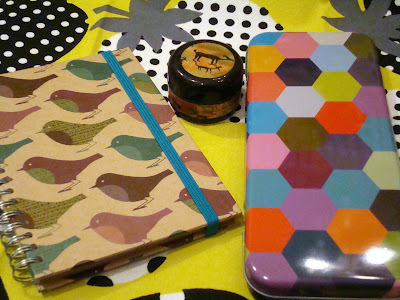 It is patchwork and animals in some great colors. The animals are very Japanese. This would make a cute bag. Have sew much fun this weekend! It is pretty silly to start a new project when I have a long list of other things I need work on. I never had ADD as a kid or adult until I started making quilts as a passion. Now it seems I have a hard time concentrating on some projects. I've always been a finisher, and though and I don't plan on changing, it does seem I am less focused on that goal sometimes. That said, last weekend I started a new bag. And it is finished! But I suppose after this I'm back to my list. 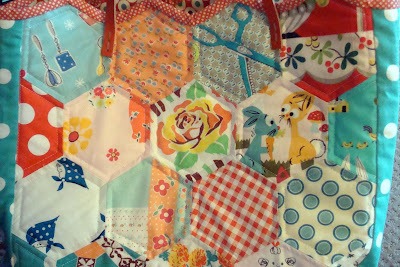 I thought it would be fun to make a hexagon bag since I've seen several hex bags in my Japanese patchwork books. Here is the front. Here is the back. 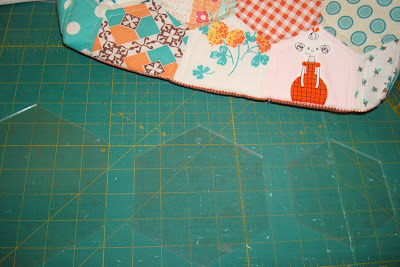 I quilted around the hexagons 1/4" from the seam line. I am a scrap lover so I picked out oranges and turquoise from my stash. Some of the fabrics are small feed sack pieces. I had some thin leather straps that have been calling my name for some time. I'm not sure the fastening is very sturdy though so I won't be carrying bowling balls around in this bag. I made the sides and bottom in accent colors. Orange and turquoise have been fun colors I've been enjoying lately. 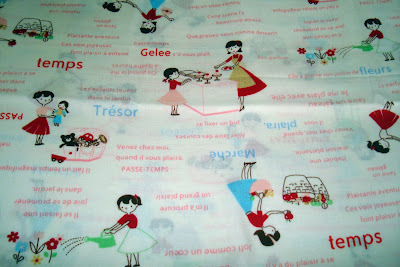 So I told you I about the fabric I got at the Quilting Cottage on Saturday. 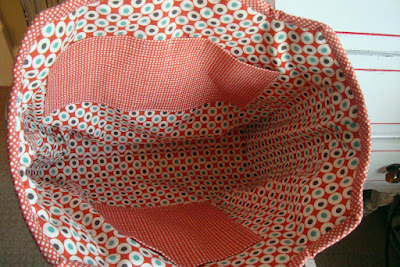 The lining and accent fabrics are the oranges I picked out to go with this bag. I finished the tulip top off with a bias binding. I really enjoyed making it but it was kind of labor intensive and not for the faint of heart. I think I'm afraid to really use it. I don't want to muss up the loveliness. I may just hang it and enjoy looking at it. 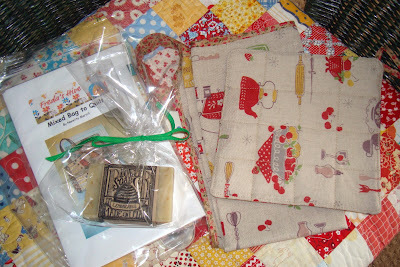 Here are some of the things I sent to my swap partner, Lorraine. I changed my mind so many times on what to make and what to send. I think if you have been in a swap know that feeling. I wanted to make something I would have fun with but she would enjoy, too. At least one item had to be hand made. 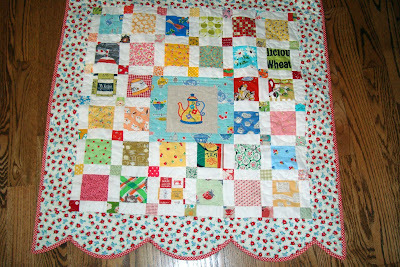 I made this table topper with a teapot theme. 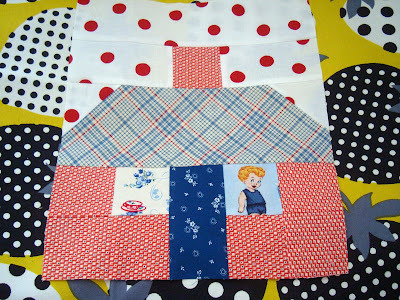 It was fun to pick out the fabric and put this mini quilt together. 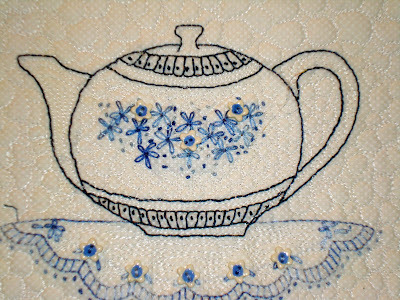 I had Michele at Calico Daisy machine embroider the teapot in the middle. She does great work. 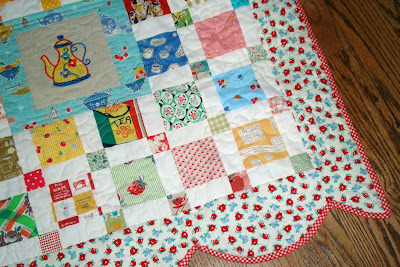 The table topper turned out vintage teapotish. Alert! Go see Dawn's finished "All Dressed Up" quilt and Susan's started one. They are so cute.